Rusty Goodman was born in 1933 in Alabama. He died in 1990 in Gallatin, TN. 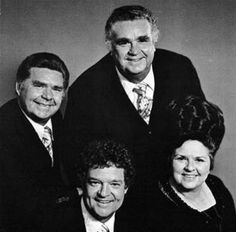 Rusty was a member of the award-winning “Happy Goodmans” singing group, alongside his brothers Howard Goodman, Sam Goodman, and Howard’s wife Vestal Goodman. Rusty won any awards, including being inducted into the GMA Hall of Fame in 1993.